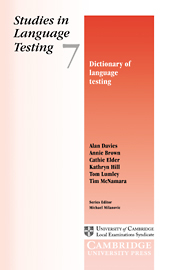 This Dictionary of Language Testing was written over a number of years by a group of researchers at the Language Testing Research Centre at the University of Melbourne. It contains some 600 entries, each listed under a headword with extensive cross-referencing. It is intended for those who may or may not have had experience in the field of language assessment but who do have a need for information. It is intended as a first stage in meeting that need, and intends to provide an orientation and, where appropriate, indicate where next to look.  The first ever Dictionary of Language Testing and as such helps define the field.  It contains extensive cross-referencing and an up-to-date list of references for further information.  Suitable for beginners in the field. 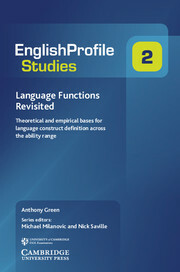 This volume introduces theoretical and empirical bases for defining English language learning levels in functional 'Can Do' terms.